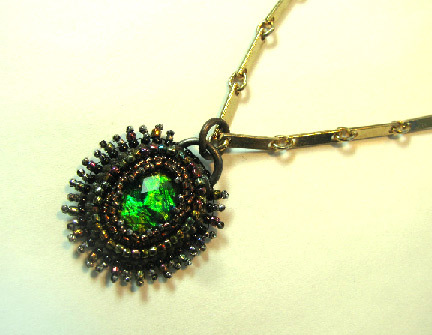 All jewelry needs a good home! 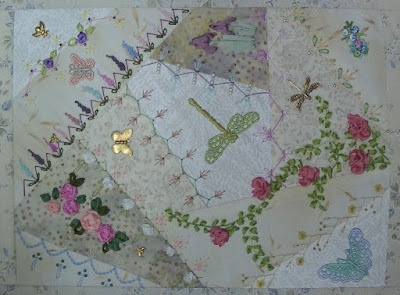 This is a "no-patchwork whole cloth" crazy quilt block. I had a small but great textured piece of silk that was left over from a flurry of painting. I drew up a crazy quilt block, re-sized and transferred it to a piece of muslin, and then pinned my silk piece in place on top. 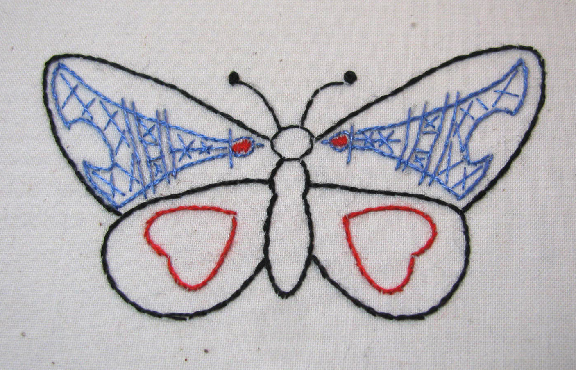 Using a basting stitch, I went over all the lines in red thread. My plan was to remove the basting stitches as soon as I had marked the seam treatments using templates, but the machine stitches made permanent marks in the silk. 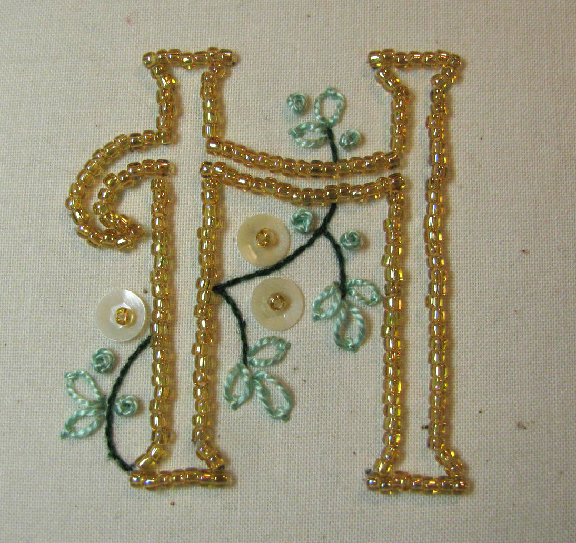 Plan B (which I came up with on the spot) was to re-stitch each of the seam lines in white perle cotton thread, using a back stitch. 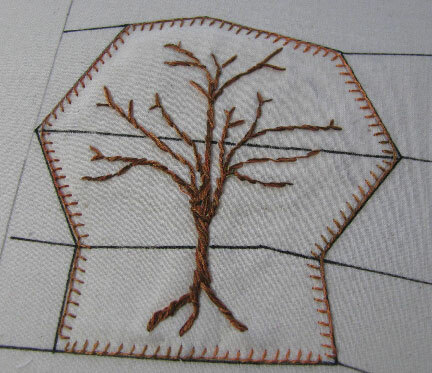 If I make another of these, I will skip the machine basting step and just stitch the "seam" lines on to begin with! 1. Draw block. If needed, scan and size with photoshop and print out. 3. Trace. Copy over tracing on the back with black pen. 4. Use lightbox to trace wrong side of pattern onto the back of the muslin foundation (so that it will be right-side up on the top. 5. 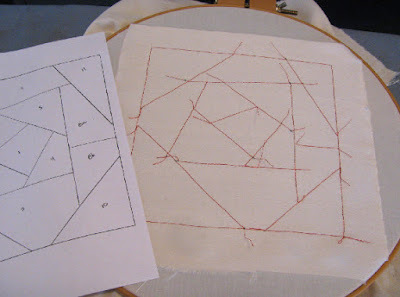 Baste muslin to silk top using red thread in the bobbin along all seam lines and the edge. Red thread should show up on the top of the silk. 6. Use the tracing paper pattern to plan out seam treatments and other embellishments. 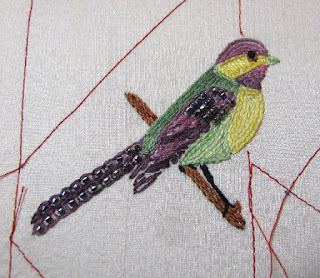 Next week, I'll show you the seams, embellishments, and finishing in part two. Jean reviews Creature Feetures: 30 Crochet Patterns for Baby Booties by Kristi Simspson--how adorable and fun! 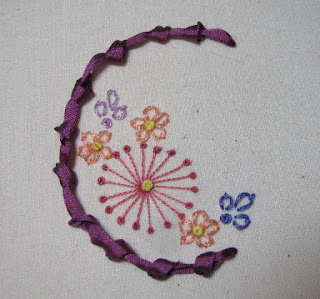 Connie's added a new free chart that will be great for a scissor fob or needle case. Charming watercolor Easter cards require few supplies: watercolors, water, watercolor paper, black waterproof pen. 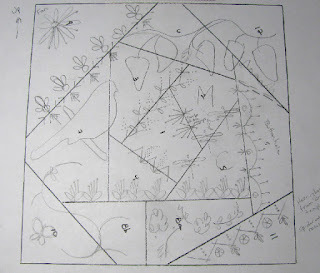 Try these six simple designs of bunnies & flowers. Madelinetosh yarn, is it worth all the hype? Terry put together an easy tutorial on how to make a fancy shepherd's hook clasp. It's spring break in Arkansas, so Sarah is getting inspired outside the craft room with a visit to the local botanical garden. Oh my! These are almost too cute to wear. Have you ever played around with origami? Maybe as a child? If you did, and you liked it, did you ever think about wearing your creations? 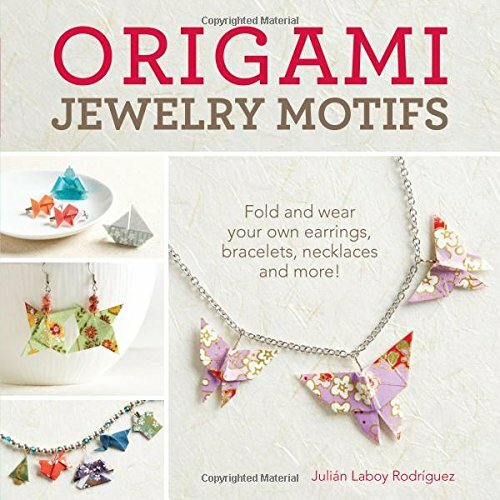 Julian Laboy Rodriguez did, and he shows you how in his new Interweave book, Origami Jewelry Motifs. Even if you haven't done any origami before, don't let that stop you. 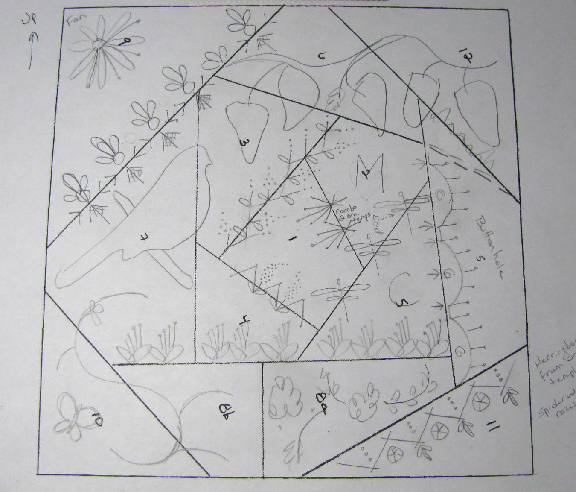 All the basic folds and instructions are covered up front, and there is a nice selection of motifs included which range from easy to intermediate. The really unique part of the book is how Julian teaches you to turn your little cuties into jewelry pieces, using easy to obtain findings, some glue, and a good spray finish! 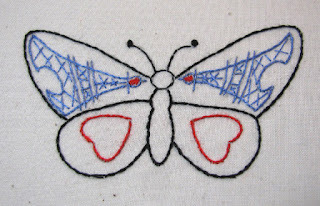 I stitched the butterfly directly following the horrific attacks in Paris. 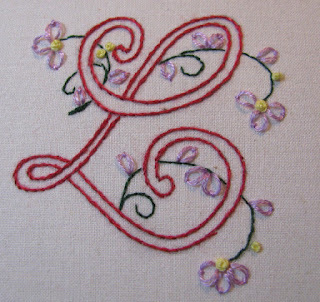 Stitching can be very therapeutic as well as allowing you to add your voice to the world. One of Connie's favorite stitchers shares a project she created from a free pattern that is a blast from the past. And still available too. Jean reviews a fascinating book which delightfully combines two crafts into one beautiful craft to greet spring: Origami Jewelry! How to sew a reversible t-shirt bag. This t-shirt bag is sturdier than the average t-shirt tote bag because it's double-thick and has a reinforced bottom. This video reviews both a cute crochet teddy bear pattern and the Craftsy class that comes with this pattern. Tape resist painting is a classic project done with kids, but it's fun for adults to try, too. Sarah made hers with painter's tape and watercolors. 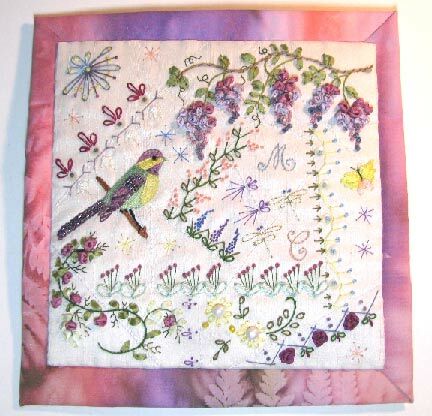 Basic crazy quilt online course registration is open! This is a free, self-paced course offered by the fabulous Kathy Shaw. If you've ever wanted to try crazy quilting or to get better at it, here's your chance! Hit the link on Kathy's name. Registration is only open until midnight of March 18, so don't procrastinate! 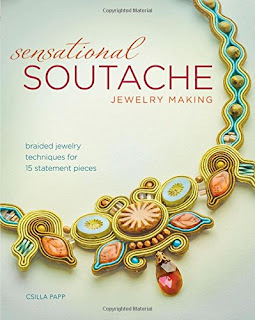 Csilla's use of color and her delightful freeform style was what first attracted me, and now I am so thrilled that Interweave has talked her into writing this book! There is a good section in the beginning on the basic techniques, which are not hard, but do take practice. Csilla mentions wishing you had 4 hands... But anyway, the bulk of the book consists of 15 drop-dead gorgeous projects, with lots of encouragement to vary the colors and focals to suit yourself. Anyone, like me, who is in awe of Csilla's great talent will simply eat this book up! 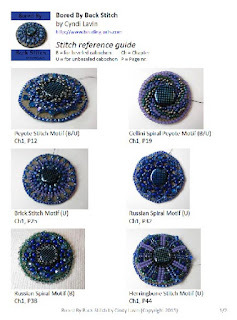 A stitch guide for "Bored By Back Stitch"
The bead community is truly one of the best groups of people in the world! Els Boesveld, who is selling her beautiful creations through her Etsy shop, Obsessive Beadwork, recently shared with me a stitch guide that she created to go along with my e-book, Bored By Back Stitch, and she wants the rest of you to have a copy of it as well! How generous is that? 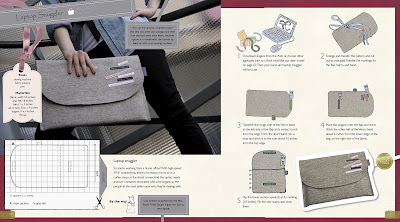 The stitch guide is two pages long and is in pdf format. Rather than blow out my email program trying to send it to all of you, I've uploaded it to Google Drive. All you need to do is follow this link, and you should be able to save the file to your own computer: Stitch Guide. 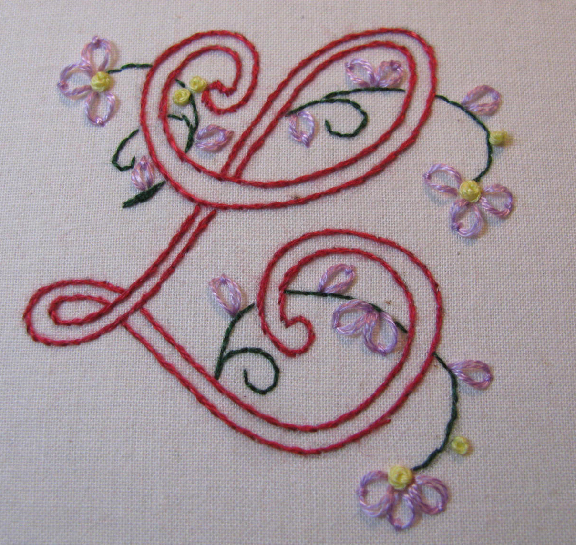 Visit Els's shop too, and you can also hook up with her on her Obsessive Beadwork facebook page! 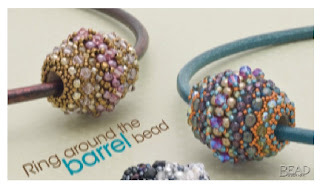 Last Monday, I talked about the beautiful jeweled egg-shaped beads (shown below) featured in the April 2016 issue of Bead&Button magazine. 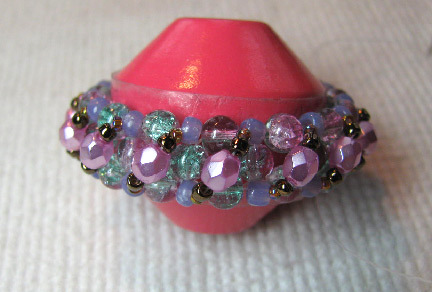 With those instructions as my starting point, I worked out my own beaded bead...except it looks more like a flying saucer and less like an egg! 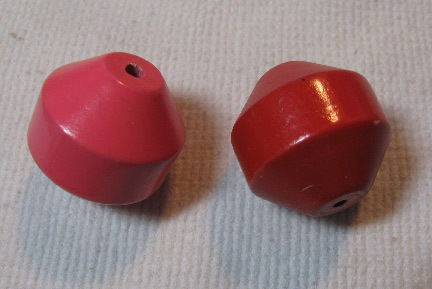 The wooden bead that I started with was quite different from the barrel beads that Fatima used, so I knew that my bead count and even the sizes of many beads would be different. Fatima starts off in the center with a band of RAW, and then proceeds to add peyote and netting stitches on either side to form the rest of the bead. I also started with RAW and added the cute diagonal stitches as embellishment that you see in her beads. 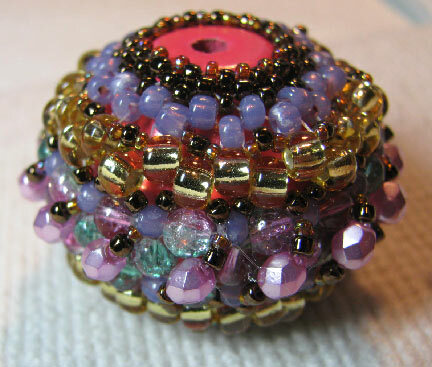 But from then on, I stuck with peyote stitch, varying the size and number of beads to suit the shape of my wooden core. 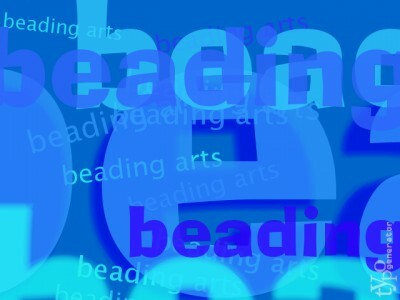 To get started, make a band of RAW in larger beads (size 6/0 seed beads, for example). Make it just a bit shorter than you will need to encircle the wooden form. 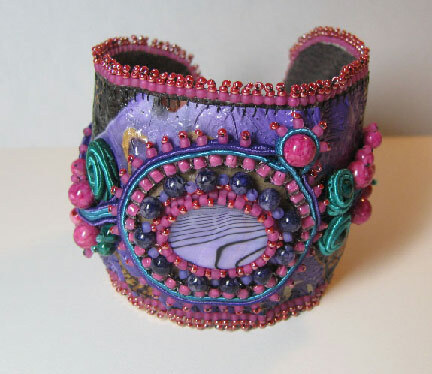 Place a piece of double-sided tape around the middle to hold the beadwork lightly in place at first. You can see the tape in the image above. Then add the last stitch or two of RAW to finish up the band. I found it helpful to work on both sides of the central band, alternating a bit, rather than stitching all of one side first and then stitching the second. It helped me to keep the tension more even, and helped me to figure out when I could removed the tape before it became trapped! 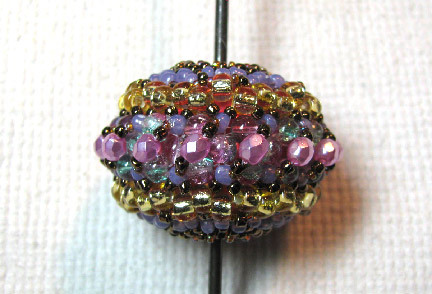 Use several rows of size 11/0 or size 15/0 seed beads to finish off each end. 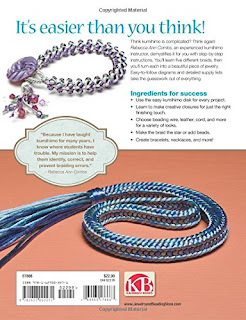 Jean reviews the very thorough and extremely helpful book, Crafter's Market 2016:How to Sell Your Crafts and Make a Living, edited by Kerry Bogert. It might change your life in a positive way! Copy a layout you like. Then make some variations. Eileen used a birthday card layout for a 25th anniversary card and a St. Patrick's Day card. Think spring! The Crafty Princess reviews an amigurumi crochet bunny pattern. To celebrate National Craft Month and St. Patrick's Day, Sarah experimented with making rainbows out of colored tape. An easy tutorial on how to make a shepherd's hook clasp for your jewelry. Here is a link to the video that started this idea. Yay!! Finally, Rebecca Ann Combs has written a follow-up book to her 2014 Kumihimo Basics and Beyond! 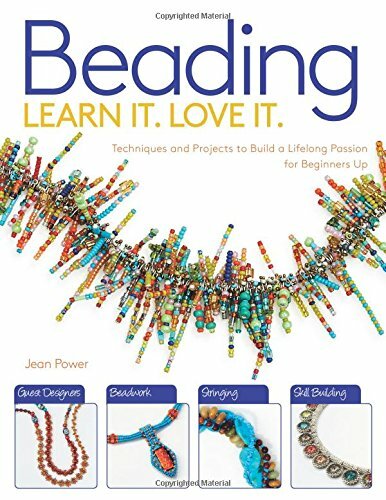 In her first book, Rebecca thoroughly taught the tips and tricks to mastering Japanese braiding using the most basic style of round braid. 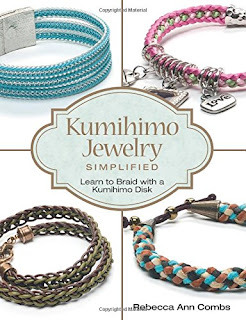 Her new book, Kumihimo Jewelry Simplified, picks up with five additional braids, and all the information you will need to turn your braids into terrific jewelry. You probably already know that these braids are quite beautiful on their own, but Rebecca also covers how to add beads to them, both during the braiding and afterwards. 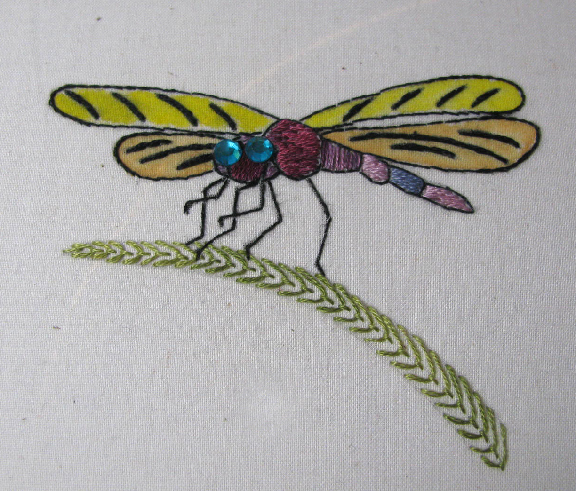 It's really quite remarkable what different looks you can achieve by varying the braid type and the fibers used. The braiding in this book is done entirely on soft foam disks, so there is really minimal expense to getting started. A couple of disks, some weights, the fibers you want to use, and some findings that you probably already have in stock if you make jewelry. The braid styles that Rebecca teaches are eight-warp basket weave, half-round, square, and sixteen-warp hollow and trapezoid braids. Besides all the great step-by-step information for each of the braids and the projects, Rebecca has included a special appendix section to show you how to set up and use a marudai, the traditional wooden braiding stand, in case you happen to have one or decide you want one instead of the disks. 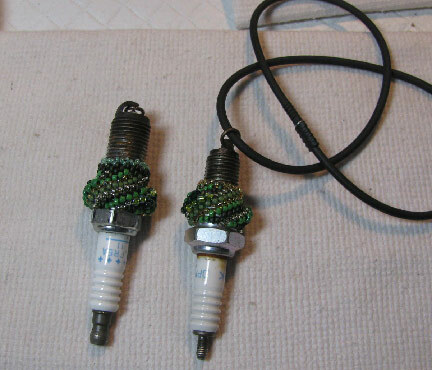 I am really excited about the beaded spark plugs that I've been working on lately, and when I received the most recent issue of Bead&Button magazine, the beaded bead that was featured got me revved up all over again! 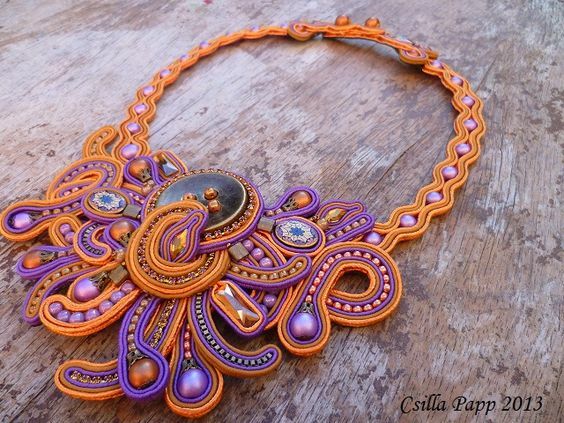 Fatima Mensen-Potter designed these beauties, which are stitched around a wooden barrel bead. Aren't they gorgeous? Perfect for Spring. They'll work! I'll probably paint them with gesso first to block out the bright colors, but on the other hand, maybe I'll leave the pink one alone and do a beaded bead in pastel pinks...? 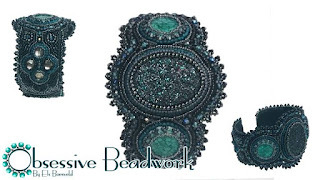 Anyway, I've posted several beaded bead tutorials here at Beading Arts in the past, so I thought I'd share those with you while I figure out what to do with these wooden beads. Happy Monday, and happy beading! Connie's added the next section of her free SAL. There are only 10 more sections to go, but there's still time to get in on this project! Jean reviews Rebecca Ann Combs super new book, Kumihimo Jewelry Simplified: Learn to Braid with a Kumihimo Disk--so pretty and fun! Art therapy ideas to help you weather the flu: craft videos & online classes, sketching, mixed media art that's not too taxing and lots of rest. Make your kitchen a little cuter by adding simple, colorful crochet borders to tea towels. Do some virtual crafting as you watch this fun podcast from the Crafty Princess and Tappingflamingo. Terry Jeanette, Tappingflamingo, experiments with her paper beads. How do they hold up if they get wet? Your sewing skills don't have to be totally couture in order for you to be able to make handbags that look that way! Bags for Fashionistas is a great introduction to designing and making dozens of bags that you can personalize to your own liking. 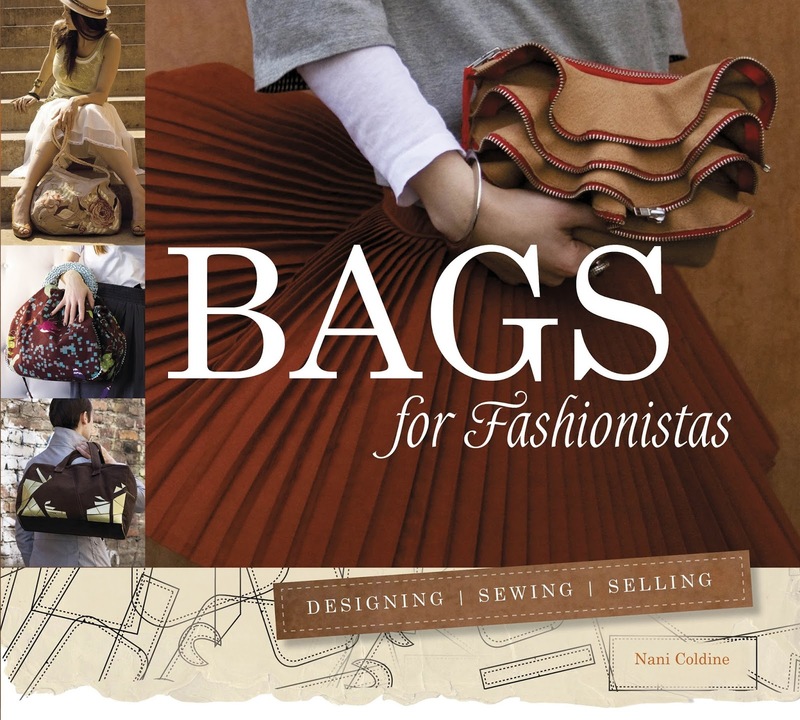 Nani Coldine has written this book for Schiffer Publishing, and I think you'll find it very inspiring if you tend to jones on purses! You'll find just about every different shape and size of practical bags in this book, but they are nice looking and fashionable as well. The sewing instructions are pretty simple for most, and there are nice grid patterns that you can enlarge for yourself. There are basic instructions in the beginning of the book so that you can refer to them whenever needed. Then each individual bag has specific directions for the details. Hobo, clutch, pochette, makeup bag, tote, laptop bag, and basket are a few of the styles you'll learn about. Each section of the book also includes an interview with a professional designer, and there is a small section on selling your bags at the end.